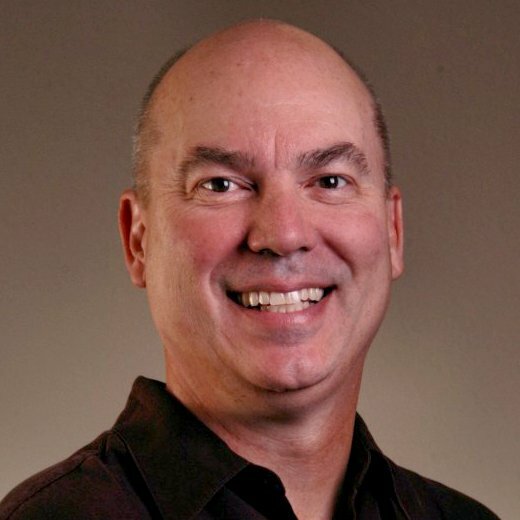 Arnie Kuenn is the president of Vertical Measures, a search, social & content marketing company . He is author of Accelerate! Moving Your Business Forward Through the Convergence of Search, Social & Content Marketing. An ideal connection between social media and search might just be “Answer” sites. The essential concept behind an answer site is that visitors can post a question eager to get it answered by someone considered an expert, who is knowledgeable in the subject matter. The response could also be powered by public knowledge with consensus determining the “best” answer. Answer sites offer users the capability to be both the inquisitor and the expert. More often than not, in basic human interaction, we can answer each others’ questions based on our own personal familiarity. We can achieve this on a massive scale using these Answer Sites. People can ask questions of all kinds on nearly every subject imaginable, and as you analyze what visitors are asking, you can more easily spot trends. From a market research perspective, this means that you’ll focus on the people that have been asking questions concerning your industry and your niche market. This way, you can obtain constructive market data about the people who are looking for solutions to their problems. If you find a widespread theme, you can create content that answers those questions and touches closely to the specific subject matter. You might even phrase your content’s title in the form of the same question people are asking. This gives your content the greatest chance to be discovered when someone types that inquiry directly into a Google search. We have found that a rising number of people use that type of search method (question format). On top of observing the current trends, you can get real time feedback about your industry from the consumers that are engaging with it using these answer sites. Ask a question on an answer site that relates to your product, and see what type of response you get from the community. These raw answers can give you very useful, and informative marketing data. Let’s take a look at the “Big 4” Answer Sites, and how to conquer them. Yahoo! 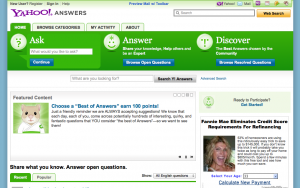 Answers is one of the most popular answer sites, and has accrued millions of questions and answers. The site gets a huge (and sometimes bizarre) assortment of questions, ranging from homework to dating to home and garden. Because of its popularity, during the 2008 U.S. presidential campaign candidates Barack Obama, Hillary Clinton, Mitt Romney, and John McCain submitted questions to the site, leveraging their campaigns on the Internet and generating a huge response from the public. The way Yahoo! Answers works is pretty straightforward: participants will submit questions to be answered by the community; when asking a question, the participant categorizes it by topic, making it easier to search and easier to answer. As an incentive to ensure that answers are accurate and free of spam, Yahoo! developed a point system. Answers are ranked by other users, and the “best answers” are given the most points. Users that accumulate points have proven to be highly regarded, and are granted certain privileges, such as the ability to ask, answer, vote, and rate on a more frequent basis. Yahoo! Answers allows you to browse by category and see what types of questions are most popular, newest, or have received the fastest responses. You can get very specific, too; every user has to categorize a question by topic before submitting it. So, it’s much easier for you to research inquiries that are relevant to your market. You can search keyword phrases to browse questions that are being asked, either within subcategories or among all categories. Answers.com marries the best of community-driven questions and answers with hundreds of respected and trusted editorial reference books. The site knows the best answer to give you, whether it summons the extensive collection of community answers from WikiAnswers, or it taps into its ReferenceAnswers database – a comprehensive set of editorial, licensed reference topics. If you have a specific, unique, complex or more social question, and you are seeking a to-the-point answer, WikiAnswers is the best place to ask your question. Anyone can ask, answer, edit or collaborate on answers in thousands of categories and subject matters. It’s another great place to see what your customers are asking about. Simply enter your keyword phrase and look to the right for various questions people are asking. Or browse through categories related to your specific market. LinkedIn is primarily a social networking site aimed at business professionals. With more than 100 million networked individuals, the site boasts the capability for linked professionals to collaborate on projects and develop their ability to communicate across their industry through LinkedIn Groups. LinkedIn offers an Answers channel as one of its tools for collaboration. The Q&A feature offers the ability for industry experts to show off their expertise to a network up to three degrees deep (your contacts, your contact’s contacts, and your second-level-contact’s contacts). Depending on how wide each level is, this could amount to a very extensive network. 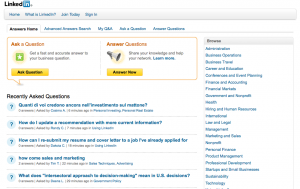 The driving force in Q&A is similar to Yahoo! Answers, as the motivation for answering is driven by a user rating system for credibility. Here the recognition is professional, where the best answers demonstrate a working knowledge of the industry. LinkedIn further rewards members by recognizing the top answerer in a weekly ranking. The motivation for making this list is industry-wide exposure as top expert in the field. LinkedIn Answers has predominantly good data for Business-to-Business (B2B) marketing. You can find questions your potential customers are asking about as they try to solve their toughest questions. By spending time in LinkedIn, you’ll get an insider’s view into the problems that your business can solve for your customers. Quora connects you to everything you want to know about. 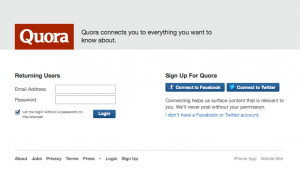 Quora aims to be the easiest place to write new questions and share content from the web. They organize people and their interests so you can find, collect and share the information most valuable to you. When you want to know more about something, Quora delivers you answers and content from people who share your interests and people who have first-hand knowledge — like real doctors, economists, screenwriters, police officers, and military veterans. On Quora, it’s easy to create a personalized homepage of everything you want to know about by following topics, questions, people and boards. Like the others, Quora is meant to be a useful knowledge-indexing tool, a database of information provided by users. However, Quora is a continually improving collection of questions and answers, reviewed by users, edited by users, flagged as useful or not by users, and organized by everyone who uses it. The creators’ goal is to have each question page become the best possible resource for someone who wants to know about the question. By using Answer sites for research, you can quickly develop a list of content development ideas helping you through one of the biggest challenges of content marketing. To learn more about boosting your content marketing efforts, check out Vertical Measures’ 8 Steps to Successful Content Marketing, a free guide that features actionable ways to create an implement a content marketing plan using popular (and often free) industry tools. Arnie Kuenn is the CEO of Vertical Measures, a full-service Internet marketing agency dedicated to helping clients drive profitable growth through content marketing. Arnie speaks at events around the world and recently published his second book Content Marketing Works. You can find Arnie on Twitter, Facebook, Google Plus and LinkedIn.